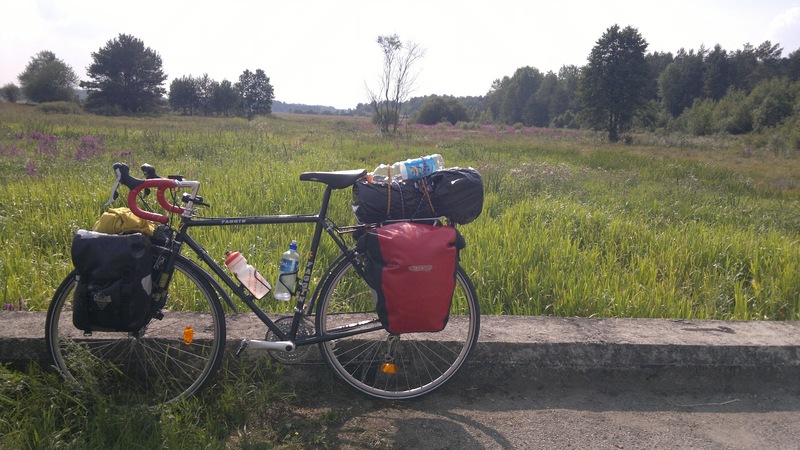 this is ester's blog: I miss being on a bike-trip. I miss being on a bike-trip. Two weeks ago, Sunday 9th September, i cycled into Istanbul. 6 weeks exactly, and 4183km. Now i'm back in London, getting my head around being a student - staying in one place - again. I miss cycling, camping, everything! 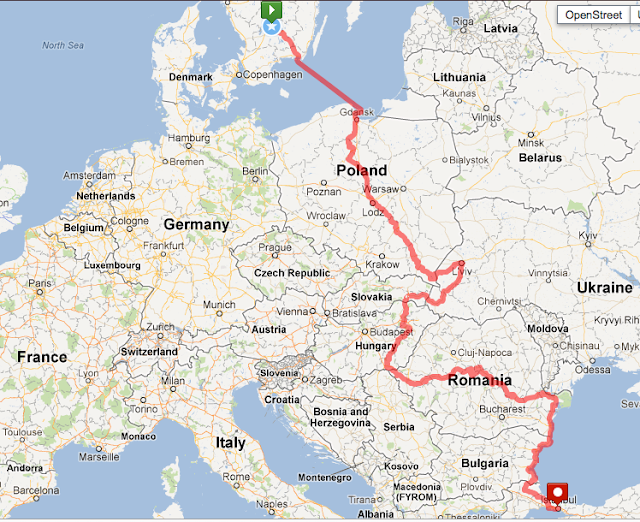 As you can see from the map, my route ended up being quite different than originally planned! People i met, things i heard about on the way, and sometimes just taking a wrong turn or spur of the moment decisions, meant that i made it up as i went. I can't decide what place i liked best, but i would definitely like to go back to Ukraine again, and also cycle in Serbia and Macedonia and through the centre of Bulgaria, since i didn't make it there this time. I met some amazing people, saw lots of birds, interesting places and beautiful nature, and ate a huge amount of food. I (obviously) cycled alot - on every type of road, track, and path i can think of. Up and down small mountains and big hills, over the too-flat Great Hungarian Plain, through forests and villages and towns and cities. I swam in rivers, streams and the Black Sea. 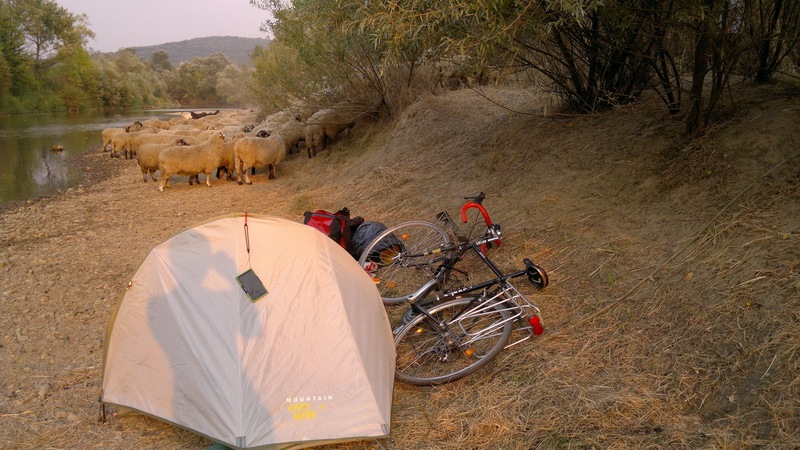 I slept in my tent, a cave, a monastery, a vegetable truck, hostels and one Romanian hotel. I got 9 punctures, but otherwise Faggin didn't have any problems - thanks again to the Vintage Bike Cave! And now i can't wait for the next trip! I just have to finish my masters first. If anyone has any questions about gear or anything, just ask! Vi har försökt hänga med din resa genom Europa och vi tycker att du har gjort en fantastisk resa. Att du dessutom har cyklat ensam ger en extra tapperhet till din cykeläventyr. Vi tänker mest på att sätta upp och ta ner tält, laga sin kvällsmat och att fatta snabba beslut. Du beskriver människorna gästfrihet och trevliga möten som en av de roligaste upplevelserna. Vi kan hålla med om. Vad skulle den vackra naturen betyda dag efter dag, utan en touch av möten med den lokala befolkningen? PS. Vi saknar mer detaljer och bilder från resan så vi fick fylla i bilderna med lite fantasi.